First race! 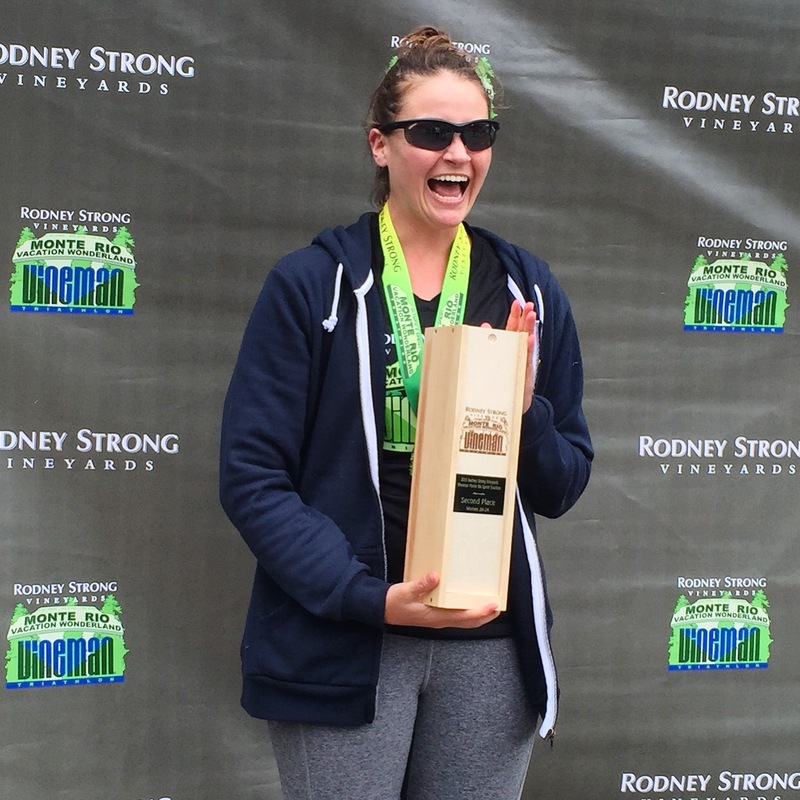 I competed in the Rodney Strong Vineman Monte Rio Sprint Triathlon. This was my first triathlon! I was definitely worried about the run going into this race. My running fitness just wasn’t feeling up to par – and considering this was a Sprint race, I was feeling pretty down on myself. On top of that, Monte Rio features a relatively short but steep grade just before the finish – as in, it flattens out with about 5 yards to go. I was blissfully unaware of this until the Pre-Race Meeting the Saturday before. But in the end, it wasn’t the run or the mini-Heartbreak Hill that was really shocking for me – instead, the first transition really caught me by surprise. 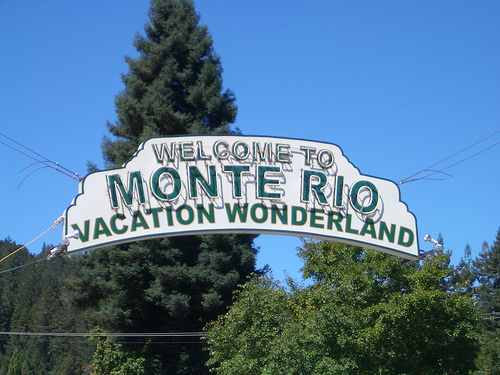 Monte Rio is TINY. There was very little race day parking, reserved only for those who bought a VIP pass. This didn’t bother me, as we showed up to the parking lot at 5:45 to pick up my timing chip and get on the race day shuttle. I understand the timing chip folks got quickly overwhelmed after we left, which may have affected some racers’ start times (see the start below). The swim takes place in the Russian River and is a gentle up and back. Upstream in Guerneville, seasonal dams are placed in June, so the water level downstream in Monte Rio is (usually) deep enough to swim. The water was temperate, between 65 and 70 degrees – wetsuit legal – and most wore wetsuits. The swim leg was a deep water start, about 200 yards upstream from the swim exit, and age groups started in waves. The sprint women were the last to start, and I think the distance from the beach affected many people – a bunch of folks in caps that didn’t match mine either had to fight their way through our wave to start, or waited until our gun went off to have a better sense of timing. The swim itself felt great for me. I was confident in my speed, so I started on the outside front of the line. I felt myself push ahead and quickly caught up with the previous waves. I hit the turnaround, started back, and kept swimming straight. I was desperately trying to find a deep channel, though. As I neared the beach, nearly everyone was standing up, trudging through the knee-high water. I finally had to stand up and fight through, and as I did I got a good look around at my competition. I didn’t see any light blue (Sprint Women) caps in front of me, though I did see a girl fighting through just behind me. I was woefully unprepared for the 100 yards of this wading – the woman behind me, and the teenager behind her (who ended up 1 and 2 overall) beat me to the beach by 8 and 2 seconds, respectively. The march up the hill to transition was a shock to my legs, too, but it provided me with an opportunity to vastly improve my T1! Wow this was hard. I don’t know why I thought I’d feel so fresh coming out of the water – I know that after my sprint swim races my legs are tired, why should this be any different? Tore off the wetsuit, pulled my hair into a low bun, put on sunglasses, my helmet, and gloves, and off I went. Next sprint, I’m not going for gloves unless it is freezing out. My fingers got stuck and I don’t think they were that helpful. There shouldn’t be any doubt, but after this bike course, you really have to recognize the beauty of the Russian River Valley. The bike course was not a closed course, but really, not many people are in the Monte Rio area anyway. I had no problems with traffic. While the pavement quality wasn’t perfect, I don’t think it was a huge detriment – coming from Oakland, I’ve seen a lot worse! The sprint loop turns back about halfway to the coast, but the Olympic course travels all the way to the town of Jenner and turns around along the coastline. I felt really good on the bike. I’ve never done any bike racing before, so it was definitely an experience. I kept my head down, shouted “Go OTC!” at a bunch of people – all of whom were passing me, so that wasn’t great – but plugged away. I hadn’t really gone fast on my bike yet for the race, but I averaged 17.3 mph. Not crazy fast, but I was certainly happy with that! Coming back into transition was very easy, except the dismount (why is it always the dismount??). No one was in my way, nothing threw me off, I just am a dork and definitely almost wiped out. Fortunately, there were no scrapes this race day! Remember how T1 was so hard? This went by in a blink of an eye. Threw my bike on the rack, saw that my neighbors were already back, tossed my cleats on my towel, and pulled my running shoes on. Left the gloves on… did I mention dork? But was quickly on my way (forgetting all nutrition). Somehow, I later determined, I was leading my age group to start the run. This is still shocking to me – my bike was ok, but I guess my age group really struggled in the swim. But hey, now it was my turn to struggle in the run. I started out from transition, and made it across the first of two bridges – both of which I would need to pass back to the finish – and realized my limited Brick training had not fooled me. My legs were jelly. I plodded on, not knowing my pace, not knowing where I was in the pack, and decided I’d need to make it to the first mile marker before re-evaluating my pace. I kept watching women with my age group on the calf pass me – boy was that disheartening. As I reached Mile 1, my body was aching. Definitely was missing the nutrition at that point. The aid station was just before the turnaround for the sprint, so I ran to the turnaround, and promptly walked. I was definitely disappointed in my need to walk, but it just leaves something to improve on next time. I ran more than I walked the next 1.5 miles, but it was very painful. I finally made it over the second bridge (the first we hit on the return), and was feeling good while I cheered at my teammates just starting their 10k. But on the first bridge, I couldn’t do it – I was so close to the finish, but I could feel my body yelling at me, angry that it had worked so hard with no nutrition. I had to walk, just a few steps, but in that moment, one woman in my age group passed me. I stayed right behind her, even as we fought up the last hill to the finish. And just like that – the race was over. I crossed the finish line. As I crossed, a volunteer with a medal stepped forward and I had to stop, which my body did not like. Simultaneously, another volunteer grabbed my left leg and took my timing chip… surprise! And I made my way through the finishing tunnel and out into the crowd. After wandering around for a few minutes, jumping into transition to grab some recovery fuel, and stopping at the results table, I hung out and watched my teammates finish. I was incredulous, but on that results slip it stated I had finished second in my age group, so I stuck around for the awards ceremony, during which I was given a bottle of (pretty nice) Rodney Strong Cabernet Sauvignon. Certainly not a bad way to finish the day! If you can’t tell, I was stoked. This was a fantastic day. I thought I would maybe like triathlon, but before this race, I wasn’t sure. You can definitely say I’m hooked. I’m in love with the sport. I needed something to spark my passion after so many years of swimming, and this was definitely it. Previous Previous post: Oh, hey.